Enter the Veho bluetooth speakers from the nice guys at MobileZap. 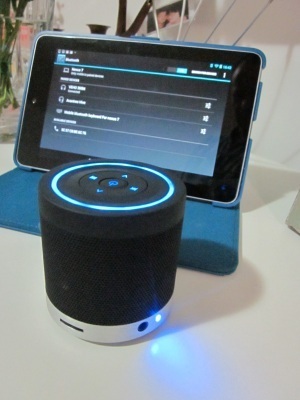 These device has 2 speakers and dramatically increases the audio output volume of the Nexus. Straight forward to pair and connect vie bluetooth, the Veho just works and with 2 decent speakers gives output similar to a small portable CD player. If you need to fill a room with sound the Nexus 7 speakers aren’t going to do the job - but with these connected using your Nexus 7 with a number of people in a room is not a problem. The Veho looks great and given its very small size produces decent sound. Quality of the sound is questionable - but if you don’t care to much or compare against a Bose system its does the job and works great. MiniUSB is a pain point for this device, given that the Nexus and most other devices are now powered by Micro USB rather than the old Mini USB connections it means you need more cables lying around to charge the device. Its not the end of the world though. The only other issue with the Veho is that sounds quality is good for the price but can’t compare to against premium bluetooth speakers.